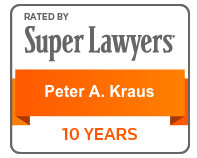 Peter Kraus is a founding and managing partner of Waters Kraus & Paul. A native of Dallas, Texas, Peter earned his bachelor’s degree from Duke University and his law degree from the University of Texas. He began his career as a commercial litigator in Washington, D.C., and has since focused his practice on toxic torts, False Claims Act whistleblower cases, and pharmaceutical injury litigation. He has tried numerous asbestos, benzene exposure, and pharmaceutical cases to verdict in state and federal courts across the country, including many multimillion-dollar verdicts. He is an ardent supporter of consumer and victims’ rights, having testified before the Texas Legislature and frequently lobbied Congress on behalf of asbestos litigants. Peter also serves on several asbestos bankruptcy creditor and trustee advisory committees. He is involved in steering committees for both U.S. and Texas asbestos multidistrict litigation, and has served on the ABA Commission on Asbestos litigation. In December 2014, he was appointed by then-Senate Majority Leader Harry Reid to serve on the board of the Federal Judicial Center Foundation. 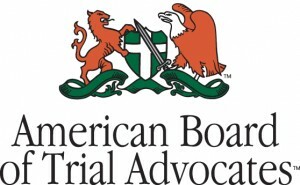 Licensed to practice law in Texas, California, Hawaii, Missouri, and Virginia, Peter has been elected for membership in the American Board of Trial Advocates by his peers. He has been selected by his peers for inclusion in the 2019 Edition of The Best Lawyers in America© magazine for his work on behalf of plaintiffs in Personal Injury Litigation and Product Liability Litigation. He has received this recognition for four consecutive years beginning in 2016. 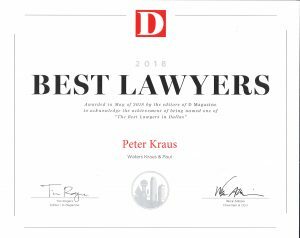 Peter has also been recognized on the D Magazine “Best Lawyers in Dallas” list and the Thomson Reuters Texas Super Lawyers® list repeatedly in the last seventeen years. Peter is active in the community, particularly in the areas of education, medicine, and the legal profession. He is the former chairman of the boards of the Greenhill School and the St. Paul Medical Foundation. He is a current board member of the Southwestern Medical Foundation and the Dallas Holocaust Museum. He also serves on the Board of Governors of the American Association for Justice and the board of the Texas Trial Lawyers Association. He formerly served on the board of Public Justice, a public interest law firm that he and the firm continue to support. 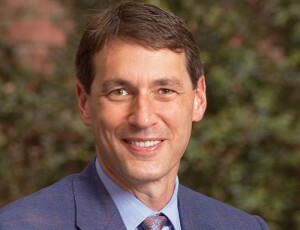 He also formerly served his alma mater as a member of the Duke University Annual Fund executive committee. He is a member of the Dallas Bar Association.